Skiing. 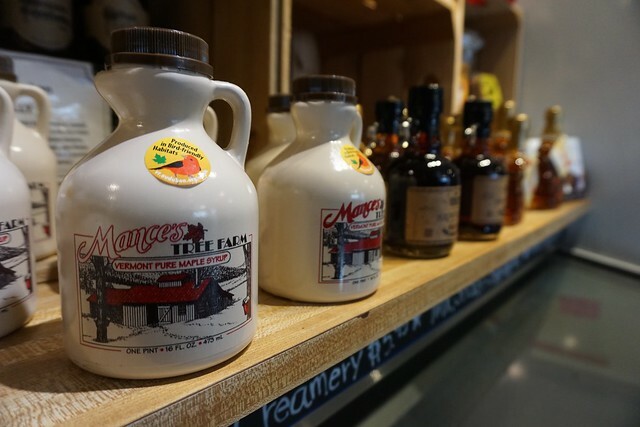 Maple syrup. Cheddar cheese. Ben & Jerry’s. Bernie Sanders. Vermont is known for a range of delights certain to deliver something to everyone, especially during the colder months of the year. In the 1954 post-war classic White Christmas, the major star (aside from Irving Berlin’s classic tunes) is the state itself. Vera Allen’s character Judy Haynes dubs it “America’s winter playground.” On a recent weekend with my husband-to-be, we made the journey north from New York to test this claim and enjoy the kind of R&R you can only get when you leave town. 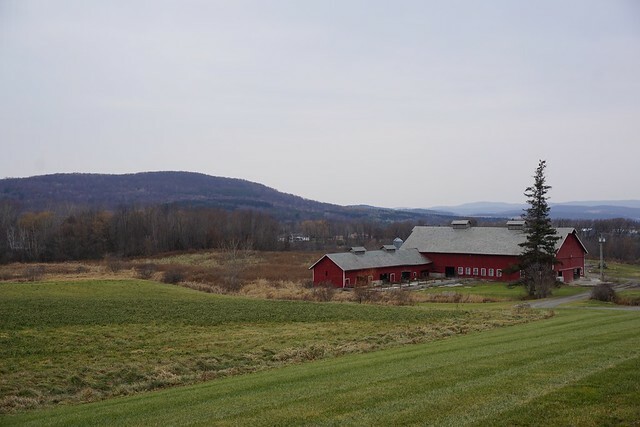 There are some areas of Vermont which, while classic, are a long haul from the city. 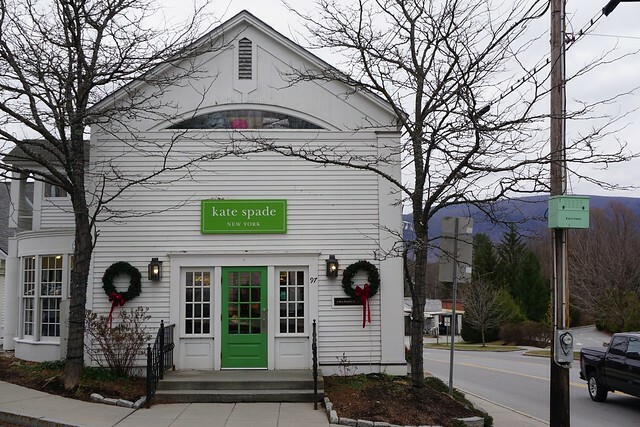 Stowe is renowned for its skiing, but can be longer than a six-hour drive. Instead, there are many gems toward the southern end of the state, offering a shorter journey from the city and just as many pleasures once you get there. Bennington is one of them. Known initially for the Battle of Bennington, a key moment during the Revolutionary War, this small town has become a welcome haven for both year-round residents and weekend travelers alike. Nestled in the southwestern corner of the state right over the state line from New York, it is about 3.5 hours from the city, making it much more manageable for a weekend away. We used Zipcar this time around, which is a fantastic option for urban dwellers like ourselves—visit a parking garage local to your apartment, pick up the car, and drive away. The fleet of cars is nice, too, generally ranging from Mini Coopers to Mercedes. 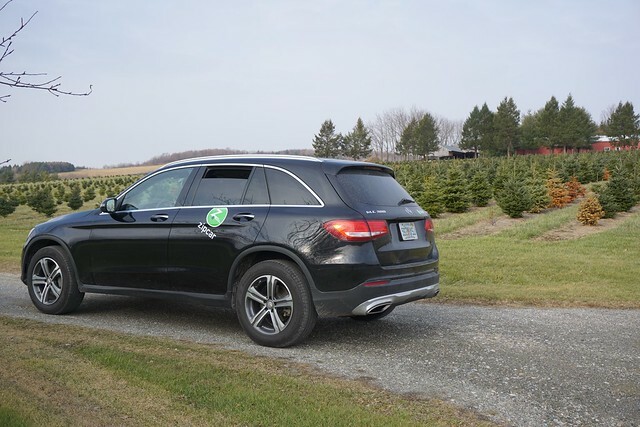 The folks at Zipcar assigned us a Mercedes SUV for the weekend, which we loved—compact, drivable and comfortable; it was a nice luxury weekend ride. Zipcar offers a pretty seamless experience from start to finish. The pickup is easy, the service covers gas and tolls, and you can return the car with only a quarter tank of gas. Once we got on our way, we were happy. New Yorkers are advised to consider taking the New York State Thruway up to Albany and turning east toward Vermont. We took the Taconic, which is scenic during the day, but takes much longer at night. We pulled into our home for the weekend—the Safford Mills Inn & Cafe. A little research into New England bed and breakfasts yields a dazzling array of options; it is a time-honored tradition. 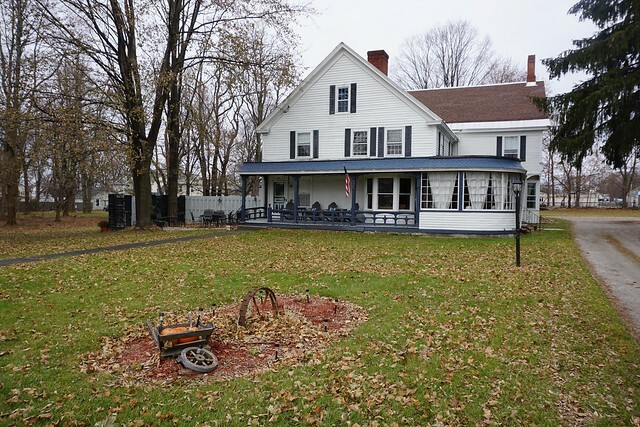 This one is in a charming old Victorian house, with three guest rooms and a collection of cozy living and reading rooms toward the front. The rooms are nicely sized, and each features a gas fireplace that keeps the bedrooms warm and offers a nice comforting glow. 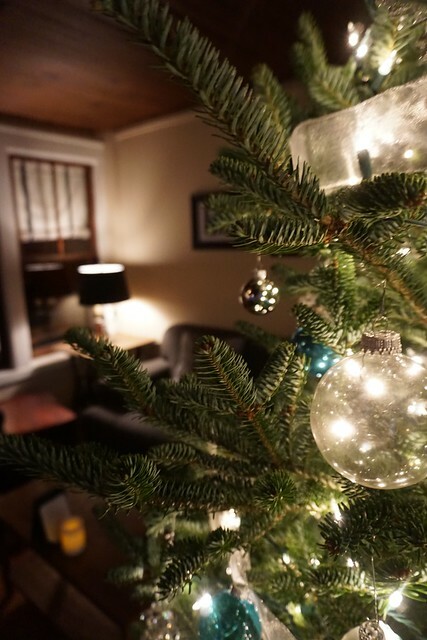 As an added bonus, the Inn is within walking distance to the town’s cozy downtown. 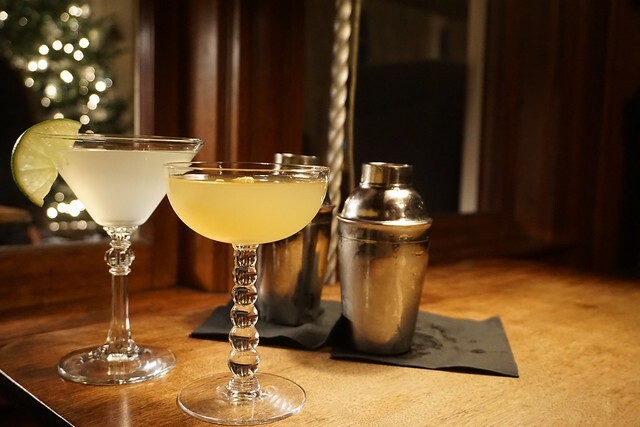 The team at the Safford Mills has delivered a nice twist on the standard B&B offering: losing the second “B.” Where most inns go for a homemade breakfast, served in the close company of other guests, the Safford Mills goes for something more our speed—cocktail service. This isn’t your standard happy hour. First, there is the list of craft cocktails, dreamt up by the bartending team at the Inn. All of them are thoughtful and well balanced—like my love’s favorite, the First Ward, featuring bourbon and chartreuse. Both smooth and sharp at once, like all good bourbon and citrus cocktails should be. Then there is the list of classics—all confidently delivered. 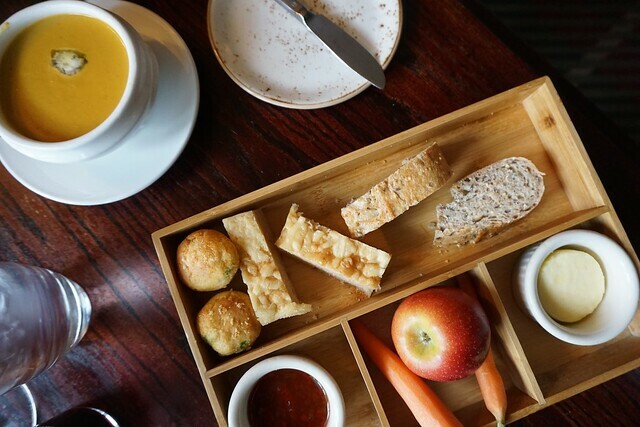 The Inn also features a food menu from its cafe: comfort food favorites with a few fun twists. 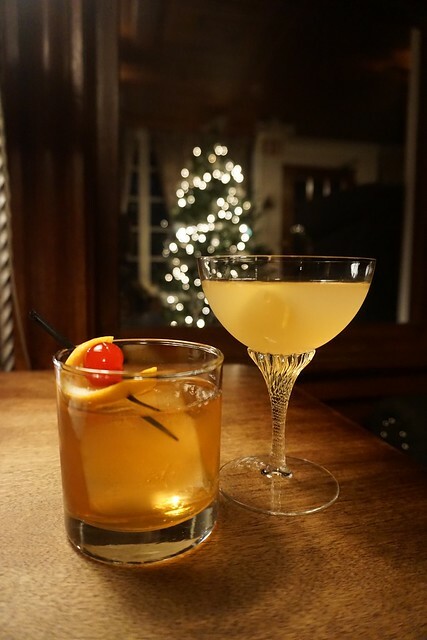 Plus, it opens to the public in the evenings, meaning the cocktail service has something of a local following, with couples on dates and small groups enjoying cocktails and music in the Inn’s cozy seating rooms. It’s a must-go for this sleepy Vermont town. Cocktailing is one of our favorite New York past-times, and it was a comfort to be met with New York quality drinks and service several hours from home. The best part? Our room was adjacent to the (cocktail-serviced) living room. We slept great that night. For those of us looking for a more traditional hotel option, head half an hour north on route 7 to Manchester and stay at the Equinox Golf Resort and Spa. 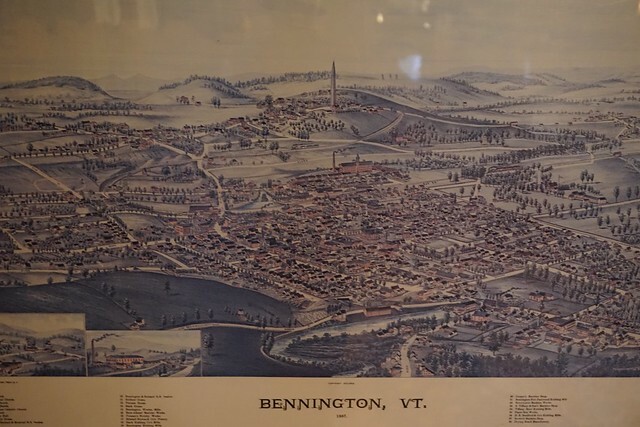 Like the rest of Vermont, it is rich with history, reaching back to the 18th century. 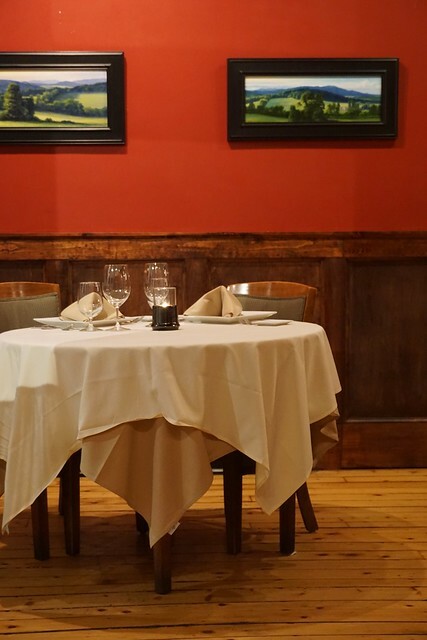 Its historic Marsh Tavern is the perfect place for a romantic lunch, and if you’re lucky, you can score a table near the fire. We enjoyed homemade soups, salads and sandwiches in this historic setting. The property also offers a spa, golf and ski outings, and a gracious staff that made the visit more than worthwhile. We started the next day right: with a hearty breakfast at the Blue Benn diner. All the locals know this place, and easily recommend it as the best breakfast in town. It’s an old railroad car converted to a diner, and solidly packed with locals every day of the week. It’s a staple in town, and tables are hard to come by on weekends. 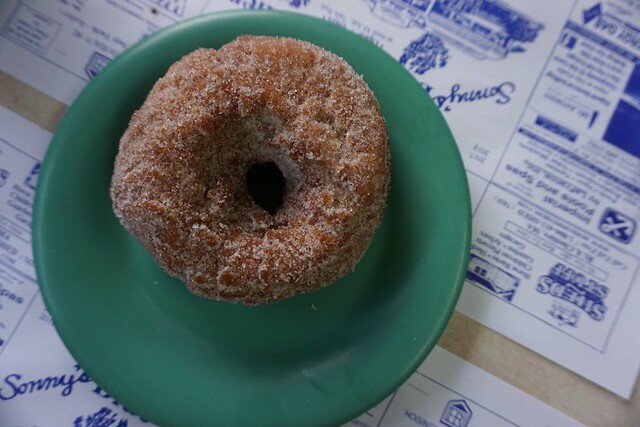 It’s worth the wait: with our spread of homemade donuts, corned beef hash, eggs, toast, bacon, sausage, and sourdough French toast (just magical)—we talked of dieting sometime in the future. The distant future. We checked out a few of the town’s attractions: the Battle Monument, the stone churches, the endearing England architecture. For lunch, we went simple, stopping at the Elm Street Market for turkey club sandwiches on pretzel bread and chicken tortilla soup. Everything is made with Boar’s Head, and the sandwiches were creative, the staff warm. They also sell wine and other essential provisions, allowing us to stock up on wine and snacks for the weekend. For dinner, we went on the recommendation of the team at the Inn, and dined on rustic Italian at Allegro, right down the block. 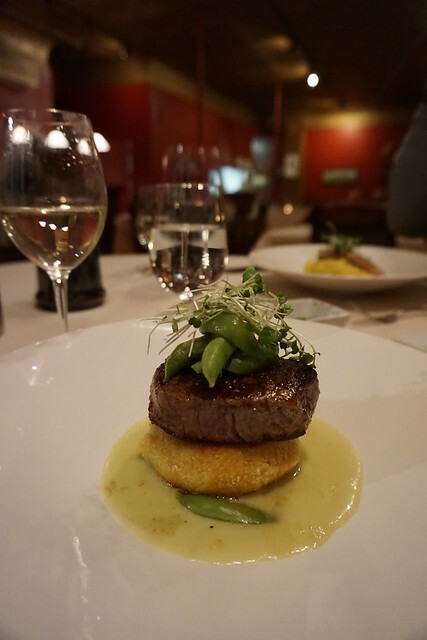 We were lucky enough to be in Tuscany earlier this year, and we were impressed by Allegro’s authentic pasta and meat dishes. A few rounds of homemade pasta and short rib later, and we were spent. The next day we started our morning with a visit to a tiny shack behind a gas station off of North Road called The Roasted Bean. Don’t let its modesty fool you: the team here serves international espresso and a range of seasonal coffee drinks at prices that are blissfully about half of what you pay in the city. As usual, the staff were wonderful. We then ventured to Love a Bagel on Main Street, a warm and welcoming shop featuring coffee and baked goods. Were the bagels as good as New Yorks? Maybe not. (The heart stays true.) But they are delicious, and definitely worth a stop if you are in town. 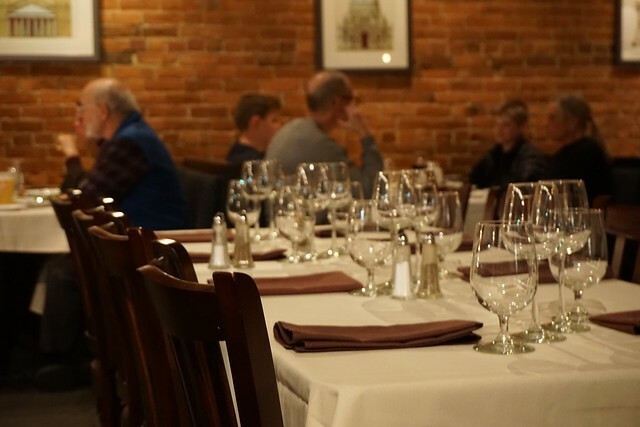 For a classy dinner, head to North Bennington for Pangaea—a gem. The space is split in two: fine dining on one side, a lounge and bar on the other. The lounge was full, but we were shocked that the restaurant was empty. We had cocktails over Trivial Pursuit cards and brain-teasers in the lounge side, then scooted over to the restaurant for an exceptional meal. You might feel like you’re in a remote suburb in New England, but you wouldn’t know it from the cuisine. We enjoyed a strangely wonderful deconstructed spring roll salad, carrot parsnip soup, steak with truffle oil and duck with cherry compote. It was high style in a rustic setting. If you’re in the Bennington area, don’t miss it. On our last day, we decided to try the town’s other diner, Sunny Side. This one is bigger and more bustling than Blue Benn, and it doesn’t disappoint. The sausage gravy and biscuits are a tasty, hearty start to a cold day in Vermont. We crowned the trip with a bit of tradition. 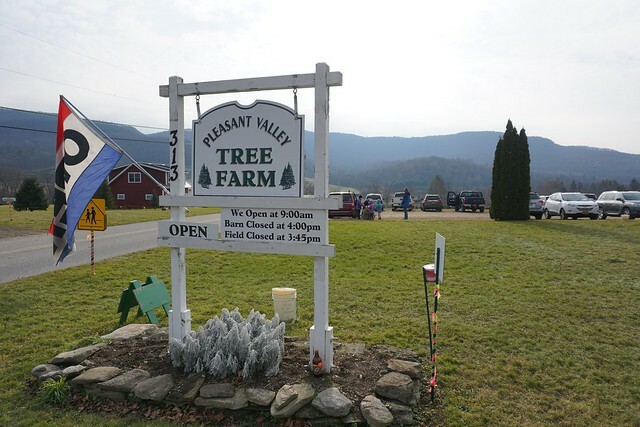 My fiancé has been visiting the Pleasant Valley Tree Farm for his Christmas tree for nearly 10 years, inspired by old movies and a nostalgic sense of Americana. Fields of balsams, frasiers and other pines nestle against a mountain ridge at this idyllic trip back in time. Christmas classics drift from speakers in its old barn. Hot cider is served. Proud red saws hang waiting for tree seekers on a stand near the door. 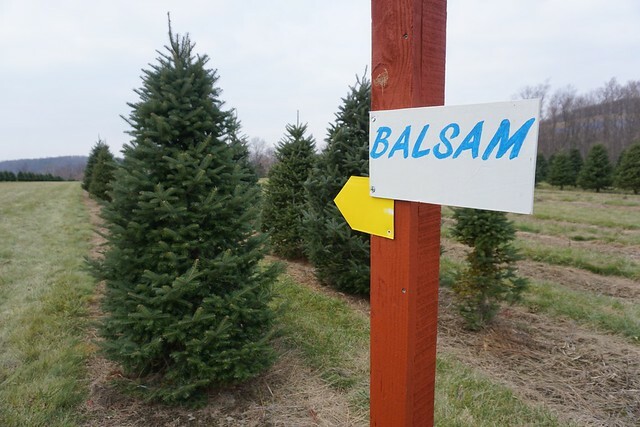 Grab and go find your perfect tree. After pretending to know the different virtues of the range of trees (they are all green and smell pretty), we chose one that we thought would work in our apartment, sawed it down, and hauled it all the way back to the red barn for paying and packaging. Another pit stop not to be missed: If you are heading west on route 7 on your way from Vermont, you would be remiss not to stop at the Big Moose Deli and Country Store. You can’t miss it—it’s the one with the moose, bear, cars, trucks and other roadside attractions begging you to stop. It may look like a tourist trap—and it is—but it’s worth it. 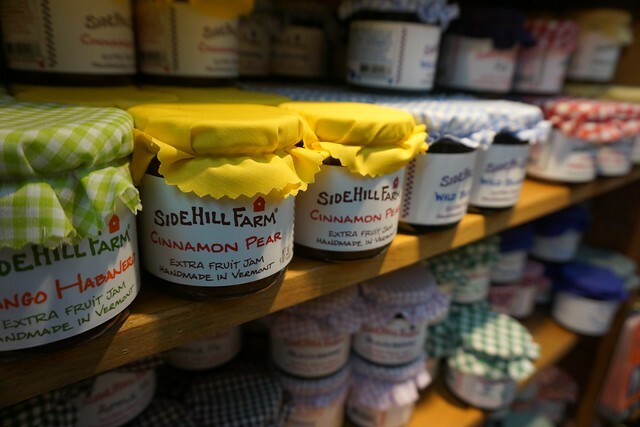 Where else can you get a BBQ pork sandwich, countless kitchen novelties, and every Vermont souvenir you could ever dream of? The shop is run by a family of veterans; they did five tours in Afghanistan! Check out their medals, thank them for their service, and pick up some souvenirs. It is the perfect antidote to the craziness of the world today. While in Manchester, make sure to pit-stop at the outlets. They aren’t huge (a blessing), but boy are they exceptional: Armani, Ralph Lauren, Kate Spade. All that, and not over-crowded, even in the midst of December. I snagged some beautiful gifts for friends and family, and even a few things for myself. Driving from Manchester to Bennington, a sign caught our eye: the Chocolate Barn. How could one not stop at such a barn made of chocolate? 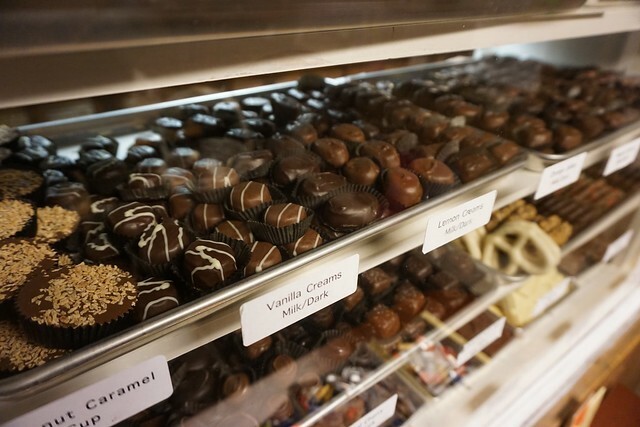 When you walk in, the scent of home-made incredible chocolate just hits you. And the family that owns the barns welcomes you with open arms. We scooped up pounds of chocolates—gifts, delights, and especially, a few indulgences for ourselves. Part and parcel to his tradition of tree cutting, my fiancé then took me to Lumber Jack’s Coffee and Snacks, a short drive west of Pleasant Valley, for eggnog lattes. We toasted to our seasonal success, chose a holiday station on Spotify, and sped away back to our urban home, fully gratified by a wonderful weekend in America’s winter playground. BitchBiz: While this post was written independently, zipcar did provide a car for the weekend.